Monin Pumpkin Spice syrup in a 70cl stylish glass bottle. The comforting flavour of pumpkin with bold cinnamon and clove notes. Pumpkins are associated with Autumn and harvest season, and with heartwarming family traditions. In the kitchen and now in this premium syrup, pumpkin is blended with subtle spices for a delicious combination of flavours. 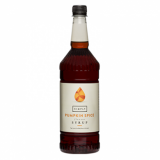 Made with select ingredients and pure sugar, Monin Pumpkin Spice syrup is a highly concentrated, authentic flavouring offering exceptional versatility for creating speciality beverages such as hot chocolates, lattes or teas. Colour: Amber with orange glint. Monin Pumpkin Spice pairs the rich Autumn flavour of pumpkin with aromatic, wintry spices such as cinnamon and clove. Maybe it’s all in the colour, but Pumpkin Spice works fantastically well with orange and carrot to make a delicious smoothie or fruit martini cocktail. You can also use it to make a Pumpkin Spice Latte, the drink that has taken the American coffee market by storm! Sugar, water, natural pumpkin flavouring, colour: E150a, natural cinnamon flavouring with other natural flavourings, natural clove flavouring, natural flavouring. Contains pumpkin juice.